In an attempt to get a better idea of what kind of movies I like, I’m posting reviews of all of the new movies that I see. Last night I watched Domino starring Keira Knightly and Mickey Rourke. It’s directed by Tony Scott, who directed Man On Fire (which I really enjoyed) and more importantly True Romance, but Domino seemed even to me to be a total departure from the power and originality of the latter two films. The story follows model-turned-bounty-hunter (wtf?) 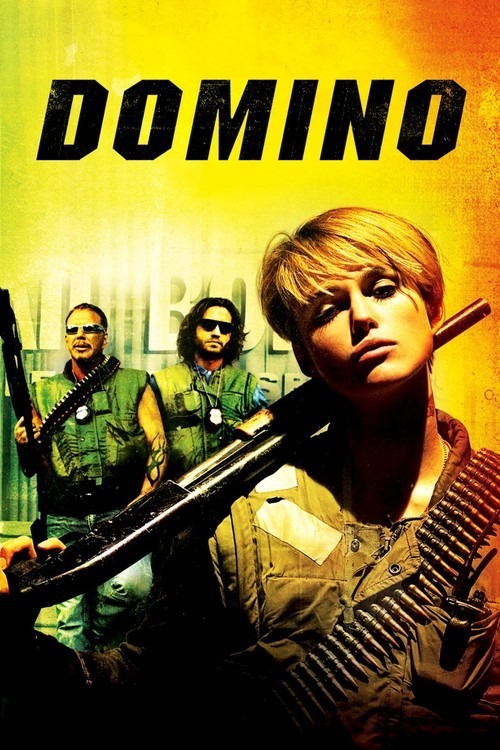 Domino Harvey into the guiding arms of Mickey Rourke, “LA’s baddest bounty hunter”. The entire thing felt like Blade 2. After living a comfortable young life as a model, her character seeks a bounty-hunter seminar (wtf?) and convinces Ed Mosby (Rourke) how tough she is by throwing a knife into the windshield of his car. And so, the story unfolds (not chronologically of course) revealing how Domino, Mosby, and Choco (the impulsive Venezuelan) become great pals while mutually embracing their love of hunting, killing, and violently removing the appendages of their adversaries. It tries to be touching and sensitive while telling the story of something as ridiculous as Hollywood bounty hunting (it’s so cool and so edgy and they so all wear Oakleys, totally awesome). One of the most exciting part of the movie was the opening credit which revealed that Christopher Walken at least had a cameo. This is exciting because everyone loves Walken; not only did he run for president (hahaha), but he’s the King of New York. Sadly, his role in this film is pretty meager and weak. He plays a slimy TV producer name Mark Heiss, a stereotypical bloodthirsty Jewish TV producer with a scheme to make a reality tv show based on Domino’s 3-party bounty hunter club. A camera crew follows them around while they maim and kill, making everything even more ridiculous, but then Brian Austin Green and Ian Ziering (from 90210!) become celebrity hosts on the reality tv show. Actually, that was one of the best parts. So many movies (eg. Anger Management, Ocean’s 12) have proven this simple fact to me before: a great cast doesn’t always even make a good movie.